Ty Cobb’s relationship with Hillerich & Bradsby dated way back to 1908, his third year in the Majors. And, unlike most players who were content to receive a small royalty in exchange for their endorsement, Cobb told the bat makers, “I’ll give you my name for nothing if you provide me with selected bats. I want you to agree to set aside the best wood that comes into your plant.” This bat is one of those carefully selected sticks. Dated to the 1921 to 1928 period, Cobb used this bat during the final years of his career. The Georgia Peach had successfully navigated the change between the Deadball Era and the advent of the home run hitter. During that eight-year stretch, Cobb never batter lower than .323 and even topped the .400 mark in 1922 at the “advanced” age of 35. In addition to holding the mantle of the game’s greatest hitter, Cobb branched out into managing, taking the reins of the Tigers from 1921 until 1926. Cobb spent his final two seasons with the Philadelphia Athletics where he hit a collective .343 and even led the AL in stolen bases at the age of 40! 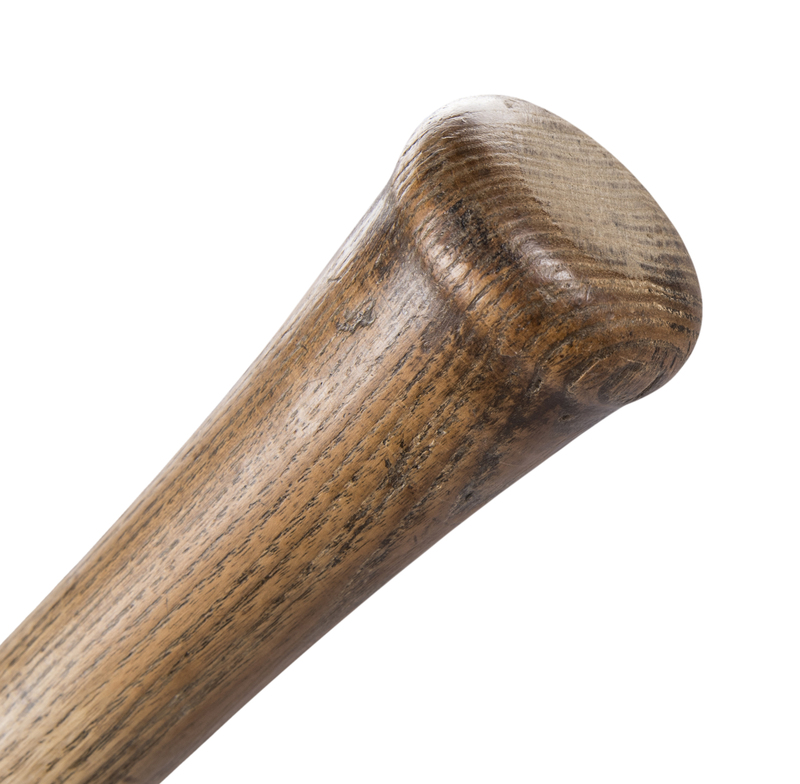 Cobb’s pre-model Hillerich & Bradsby bat shows heavy use with a repaired handle crack. 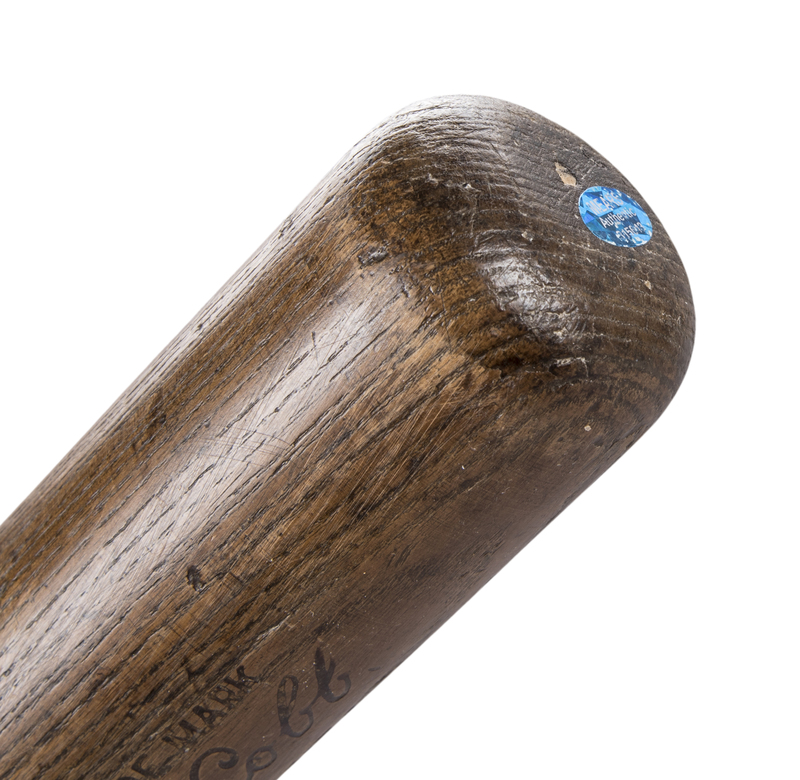 From the center brand style found on this bat, MEARS dates the piece to the 1921-1928 period. Its weight of 35.5 ounces and length of 34 inches places it within the parameters of the bats ordered by Cobb during this period. The barrel end displays multiple cleat imprints as well as several ball marks with stitch impressions. The ash has aged to a deep dark brown against which Cobb’s signature stamping contrasts nicely. A very impressive Cobb gamer dating to the period in which the 40-something veteran batted a collective .360! 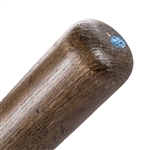 This bat comes with a LOA from MEARS (315643) for the game use and has been graded an A7.